“You’re a rabbit now; you’re a kid now” doesn’t have quite the same ring to it, but Splatoon almost went there. Nintendo’s stylish shooter once starred bunnies, and before that, tofu blocks. During a panel at the Game Developers Conference in San Francisco today, Splatoon producer Hisashi Nogami gave a presentation on how he and his team developed both games in the series, first with Splatoon on Wii U (2015) and then Splatoon 2 on Switch. The first thing they designed, he said, was a version of the game that they affectionately called the “tofu” prototype. Nogami, who has been at Nintendo since 1994 and has worked on everything from Yoshi’s Island to Animal Crossing, said he started early prototyping of Splatoon at the beginning of 2013 with a team of ten developers. Their goal, he said, was to create something brand new, a game that wouldn’t be bound to other Nintendo franchises or genres. After six months of building, scrapping, and building again, they came up with the ink-shooting that would eventually form the basis for Splatoon. From there, Nogami said, these characters became rabbits. But when he took the prototype to other people within Nintendo, they’d ask the most obvious questions: Why are rabbits shooting ink? Why are rabbits diving into ink? How does this make any sense? “Something about the concept still didn’t sit right,” Nogami said, explaining that there was a “disconnect between gameplay and appearance.” Their revelation came when one of the team’s other directors started to break down exactly how the player’s abilities would work during matches. When you were out in the open, you’d be able to attack; when you were submerged in ink, you wouldn’t be able to attack, but you would be able to move more quickly and recover your strength. From there, he said, the team started filling up the world with more content and style, using what he described as Nintendo’s “container” approach of design—first you build the container, then you fill it up with stuff. For Splatoon, they imagined a version of the modern real world, with a crustacean twist. They dreamed up bands that they thought the main characters would listen to, for example, like the now-iconic Squid Sisters. Nogami went on to explain that from the beginning, Splatoon was planned as a service game, one that Nintendo would update constantly in order to ensure that players would stick with it. “As you’re likely aware, creating and maintaining a player base is one problem that online multiplayer games have to wrestle with,” he said. “If the population is too low, finding people to play against can take time. If the problem is bad enough, you wont be able to find opponents, and the game becomes unplayable. 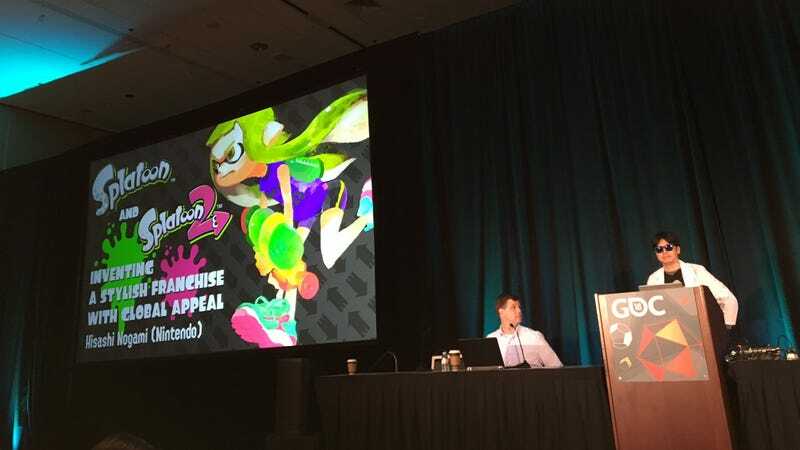 Nogami ended the presentation by talking about Splatoon’s affect on fans, telling the audience that he was charmed by the fan art and elaborate background stories that Splatoon players had created. He also showed footage from a concert in Japan, where holograms of Splatoon squids performed their infectious songs for an audience of 5,000. “It might seem a bit strange to you, but as developers, nothing could make us happier than seeing the characters we created mean so much to people,” he said.